Setting type has changed drastically from the days of metal and phototypesetting. The responsibility for composing type no longer lies with a highly skilled, dedicated typographer, but more often with a designer or production artist, who may not be trained in this skill. The awkward upper setting is improved (lower) when the first line breaks after the comma, keeping the phrase that follows, together. As a result, there are details of setting good-looking, readable type that have become the responsibility of the designer. One of these is deciding where to break lines in headlines and subheads so that they read well. “Breaking for sense” means not relying on where the software makes automatic breaks, but evaluating the text and making considered line breaks when necessary. This is determined by reading and observing the text, and breaking lines for the best readability often where one would logically pause when reading it aloud  as well as appearance. Never break up a hyphenated phrase, as in the upper setting. 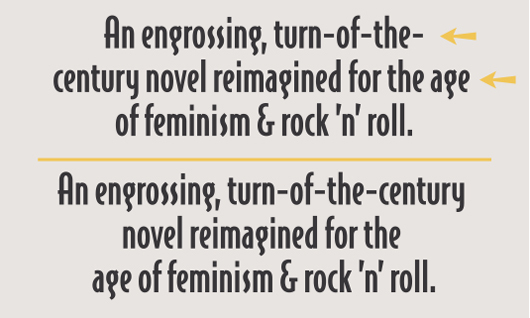 The lower setting is much improved by placing “turn-of-the-century” on one line, as well as keeping the phrase, “age of feminism” together. 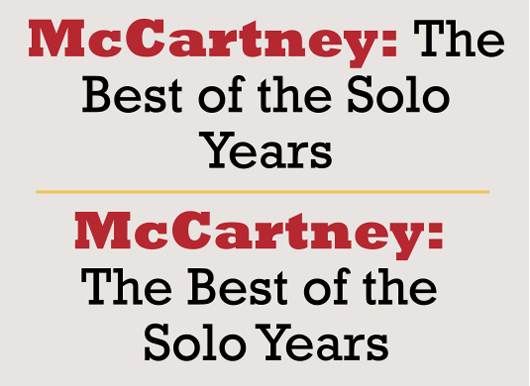 Pay particular attention when making color or typestyle changes in a heading. The upper setting dilutes the effectiveness of these changes when grouping them on the same line, which also results in a widow. A stronger treatment is below it. Designers are now responsible for making the text as readable, logical, and attractive as possible, and line breaks have a major impact on this.